Webinars are one of the best ways to reach your audiences and digital marketers use it like a weapon. If you would like to host a webinar, YouTube Live can be one of the best options. Recently, I was hosting one webinar for the Big Data and I tried YouTube Live for the online Webinar and the result was awesome. 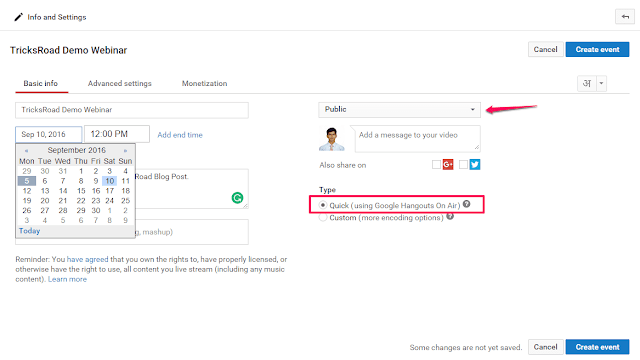 So, thought to share this detailed post on how to host webinar using YouTube Live. Although there are many other tools using which you can host a webinar like GoToMeeting, GoToWebinar, WebEx and much more. In past, GoToMetting has worked great for me and I have even attended many webinars hosted on GoToMetting. But this is more intended to less number of attendees. Also, in GoToMetting, any user can unmute them anytime and start creating disturbances. GoToWebinar is good but is bit costlier and so won’t be very much helpful for the freelancers or small scale businesses. Similarly, WebEx is also much intended to medium or large size organizations. Although free version is available but all the features can be accessed only in paid version. So, to overcome on all these I tried Webinar using YouTube and it works damn awesome! Moreover, it is free and any number of users can attend the webinar as YouTube servers are capable of handling. Earlier, Google was providing the similar webinar feature using Hangouts on Air but it is now getting moved to YouTube Live. Officially it will be moved to YouTube Live on 12th September 2016. In this tutorial on how to host webinars using YouTube Live, I will be sharing each and every step to start a webinar using YouTube Live. So as you know Hosting Webinar using YouTube Live can be one of the best options especially when you are just starting with Digital Marketing. It is free, easy to use and able to handle any number of attendees. As now Google provides single sign-in features on all their major products and so if you are having any Google account then easily you can access YouTube. 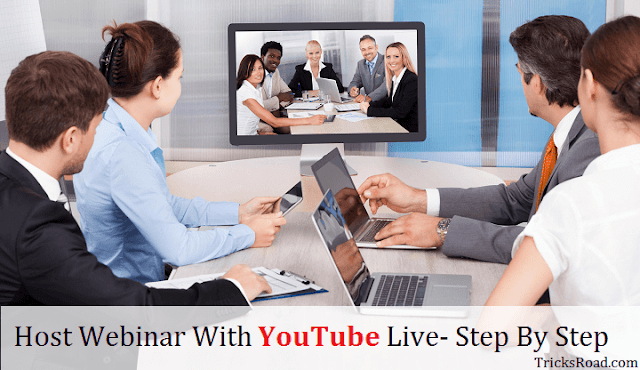 To get started with Webinar using YouTube Live, you should have a YouTube channel. If you don’t have, just follow this to create a YouTube channel easily. Now create your profile pic available at the top right corner and it will list the available channel list attached with your account. 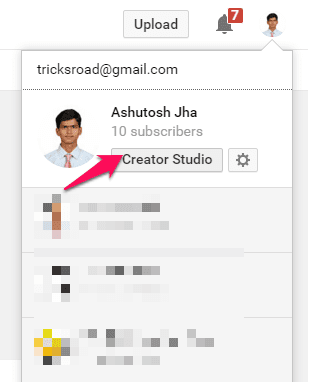 Click on the ‘Creator Studio’ of the account through which you want to use to host a webinar using YouTube Live. This will open a new page which will have a menu called ‘Events’ under ‘Live Streaming’ in the left sidebar. It will show you the list of upcoming events. If you don’t have any upcoming events then this page will be blank with a link to Create Live Event. Note: If this is the first time you are doing then you may have to ‘Enable the live streaming’. And then it may also ask you to verify your contact number. Completes these simple steps to get ready to start a webinar on YouTube Live. Click on the Create live Event link and here you can provide the Title for the webinar, scheduled date and time. If it is a public webinar, you can select it as public from the dropdown or if it is a private webinar intended for some specific group of users then select unlisted or private. Unlisted or private videos would be accessed only using the URL. Users who will be having the URL can only access it. Now in the type section, select ‘Quick’. 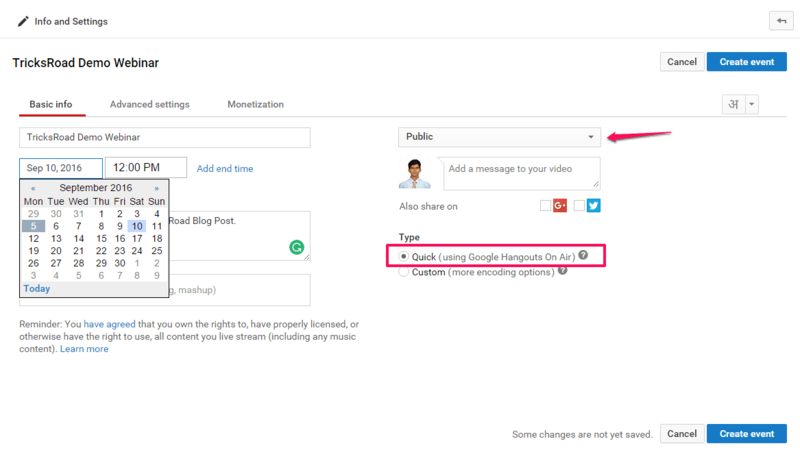 This uses Google Hangouts on Air option to replay the webinar on YouTube Air. There is one more option ‘Custom’ but this needs more customization. So it is advisable to select the Quick radio button for simplicity. It’s done now. Once you have created the event, it will show something like below in the event section. You can also monetize your webinar using the monetization tab shown in the above screenshot. The step is similar to how you monetize your normal YouTube Videos. 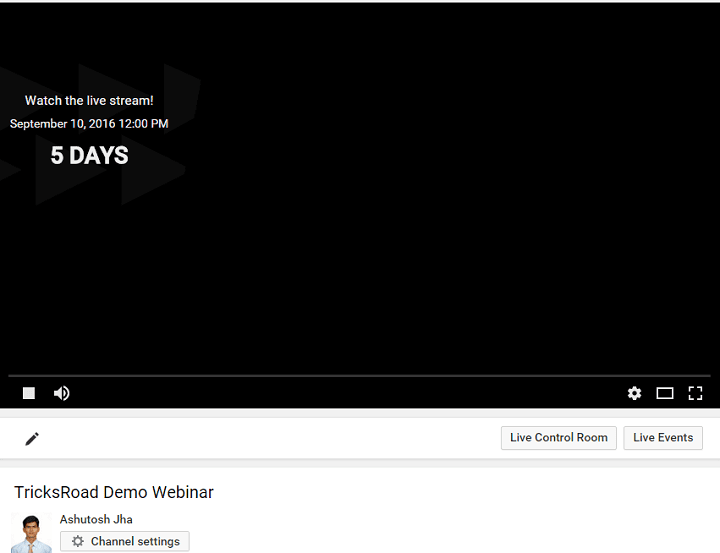 I liked hosting webinars using YouTube Live as it is smooth, easy to use and the URL never changes. The URL while scheduling the webinar, during the webinar and the URL of the final video will be same. Also, after the webinar, the same session will be converted in the form of a normal YouTube video. And as the URL doesn’t get change and so those who have missed the webinar can watch the video without changing the URL. You won’t have to share the new URL after the webinar. As we have selected the public option and so anyone can click on the webinar before the scheduled date and time. But if someone will click on the webinar link before the scheduled time, it will show the countdown for the event which looks awesome. 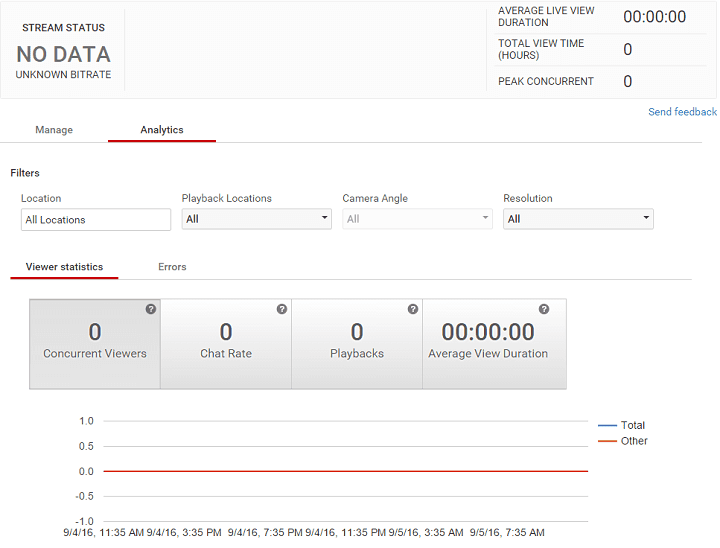 To check the live analytics, click on the Edit option, you will find ‘Live Control Room’. Click on that button and you will have complete live analytic details of your webinar. The analytics will be something like below which will show you the number of people attending, average time and much more. Once you are ready to start the webinar, just click on ‘Start hangout on air’ button and you will come live. Once you are done with your webinar, YouTube will automatically record and convert the whole webinar in the form of a normal YouTube video. You can even start the webinar some time before to confirm everything is working fine and can test on a couple of users if the audio and video are working fine. But the issue will be in the video. The whole session will be recorded in the video. If you have just tested your mic and have told something like mic 1 2 3... Then it will also come in the video. So it is advisable to edit those parts before publishing the video. Once you will start the webinar, you can either show your webcam or share the screen. You can easily do it from the top bar. Also, you can make someone else presenter by sharing the link. During the webinar, people can ask a question using the comment box available at the right of the video. Once the webinar will bet over, YouTube will take some time to create and publish the video. Once the video will get published, the total views will be a total number of people watched it + a number of video views and the comment box will be at the bottom as the normal video has. This was all about how to host webinar using YouTube Live. Although it may take some time to get to know the different option of the YouTube lives. But once you are aware, it is just a fun game to host a webinar using YouTube Live. It is easy, free and can handle loads of traffic without any issue. I hope this guide to host webinars using YouTube live gave you a clear idea to host webinar free with YouTube Live. If you have any questions, comment below!